This is me! I took an art class and my first assignment was to draw a picture of myself. I don’t look very happy here, do I? I am a normally a very happy, silly person who likes to joke around and have fun! 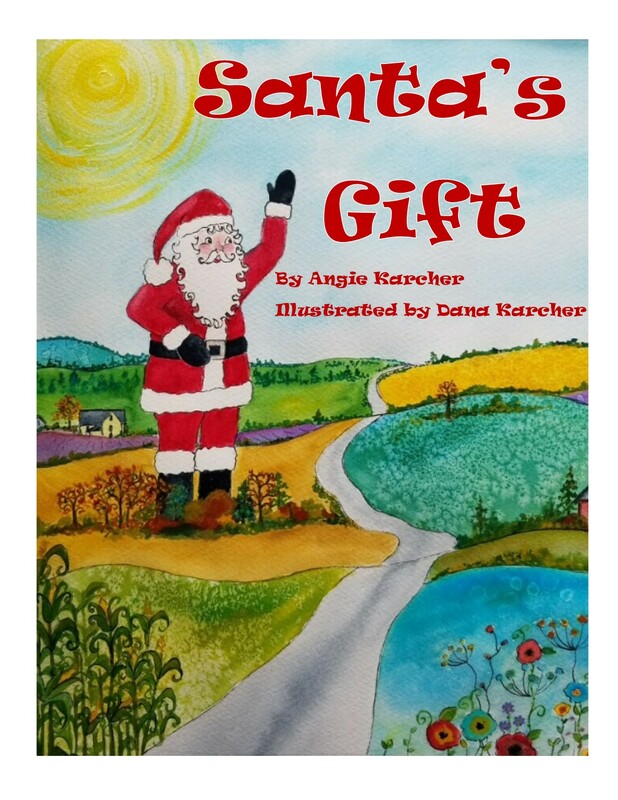 I love to write, I love to draw and I love to read so…I became a children’s author. This is my family at my first book signing in November 2012. 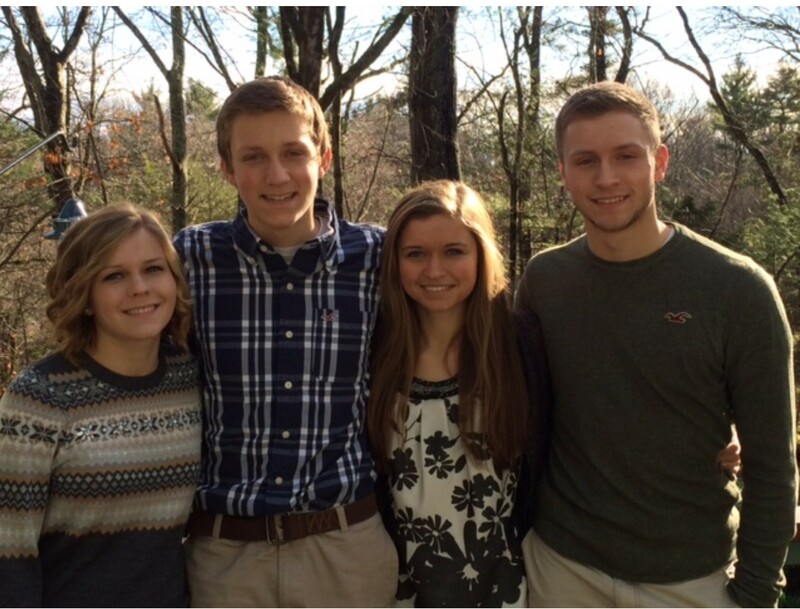 My husband Stan and I have four kids-Lauren, Evan, Michaela and Mitchell. 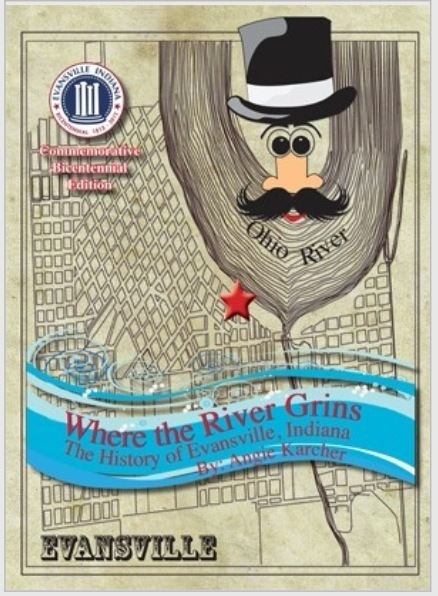 My debut book, WHERE THE RIVER GRINS is a history book about Evansville, Indiana, a city on a bend in the Ohio River. The bend looks like a grin, as if the river is smiling! These are my kids today! This is me in my first “Selfie” at midnight on New Year’s Eve 2014. I call it my “Twelfie” as it was taken at 12:00! 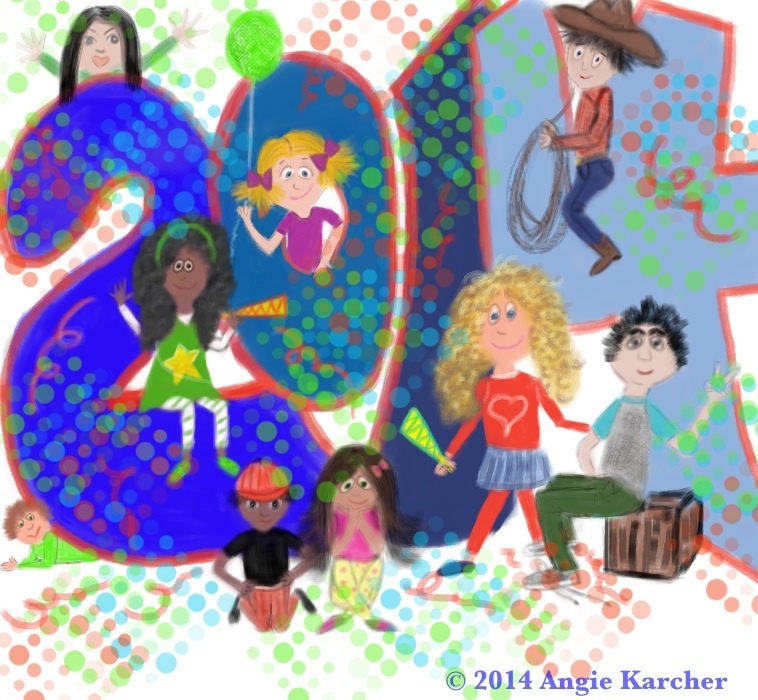 I drew this picture on January 1, 2014 to celebrate 2014 and share how much I enjoy writing, drawing and teaching kids! Every job I’ve ever had was connected to children. I was a Kindergarten Teacher, Developmental Therapist, Director of Education at a children’s museum and a Storyteller. But now, I have the best job in the world! I get to stay in my PJ’s all day, walk down the hall to my office and sit at my desk, looking out at the woods while I write books for kids! This is me when I was seven years old. 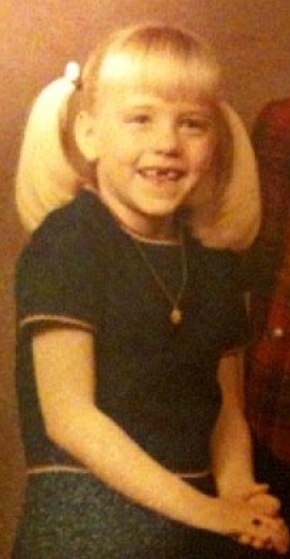 I didn’t have any front teeth and I couldn’t whistle. I loved school and I loved to read! One of my favorite books was written by my favorite author, Dr. Seuss. 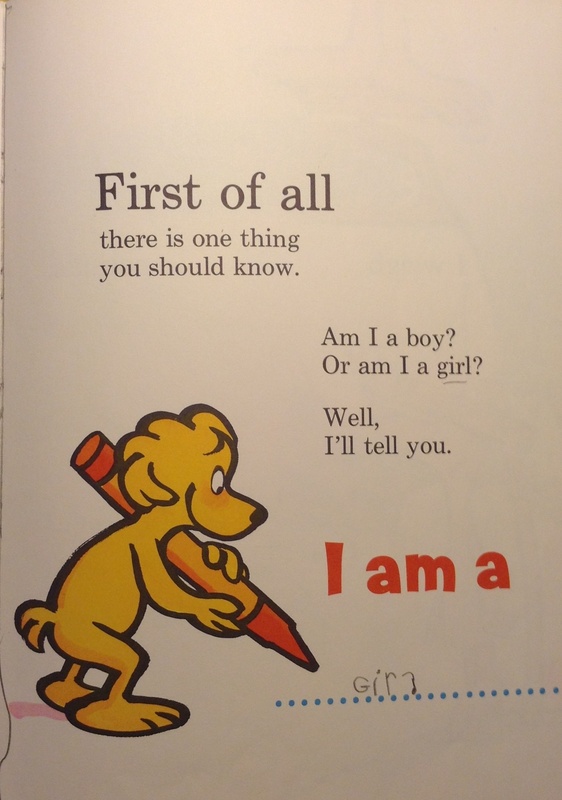 It was called All About Me and it was the only book I was ever allowed to write in! This book asked questions about me and I filled in the answers. 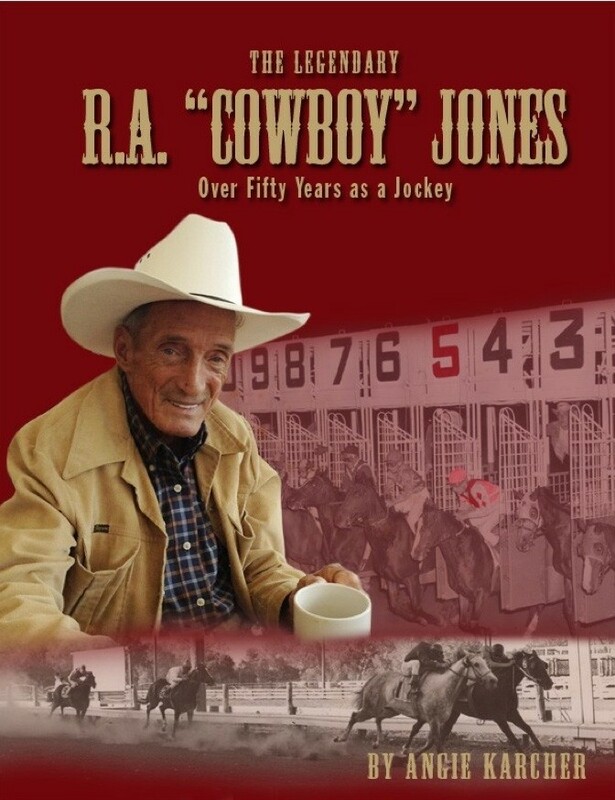 So, it was sort of a biography about my life…pretty cool! Here are some pages from that book. Are you ready to read about Me? This is my book about me by me! I wrote this book in 1974 when I was 7 years old. I am still a girl. I still have blue eyes. I still don’t wear freckles. My house today has 24 windows, 5 beds and 46 pictures on the wall. My house today has 18 steps, 58 forks and 6 keyholes. In my house today there are 32 lights and we have 12 clocks. In my house today we have 10 mirrors, and 5 cold/hot water faucets. My birthday is still January 13th and I have 50 candles on my cake. That’s a lot of candles to blow out! I have read hundreds of books. My favorite book is The Braid by Helen Frost. I am right handed. I can stand on my hands today for zero seconds. My feet are still ticklish. My favorite pets are my dogs Gracie, a beagle and Lucy, a dachshund. It is 21 steps from my door to the first tree. It is 192 steps from the tree to my mailbox. It is a 6 minute car ride from my mailbox to the first store. Believe it or not…orange is still my favorite color! I think my drawing skills may have improved a little bit in 40 years. This is a silly bird I drew today. Today I collect Norman Rockwell prints, antique games, children’s picture books, postcards from places I visit and…I still collect seashells. My favorite thing to collect is HUGS! Today my favorite sport is tennis. I haven’t played croquet in many years but I can spell it correctly now! My favorite song today is Pontoon by Little Big Town. I love to sing in the shower, I am not a great whistler and I hum better than I whistle. My favorite instrument is the piano. I took piano lessons when I was 34 years old. Look what I wanted to be when I grow up…a writer! I am not a secretary or a policeman but I am a writer. This is what else I wanted to be when I grow up…I have never been nor will I ever be a circus actor! But, it sounds like fun! Yes, sir! That’s my book about me! I own 14 shoelaces. I own “TOO MANY TO COUNT” buttonholes! After much thought, I do wish I were a giraffe! So, be yourself and wear your hat proudly my friend! Buy yourself an All About Me book! 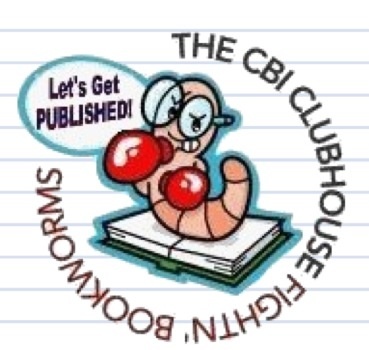 You can be an author too! Wow! I’m so glad I found your blog. Angie, you sound like so much fun. I so wish I had one of these My Book About Me books when I was a child. It’s so cool that they are still available. I may just have to buy a few (one for me and a couple for my nephews). 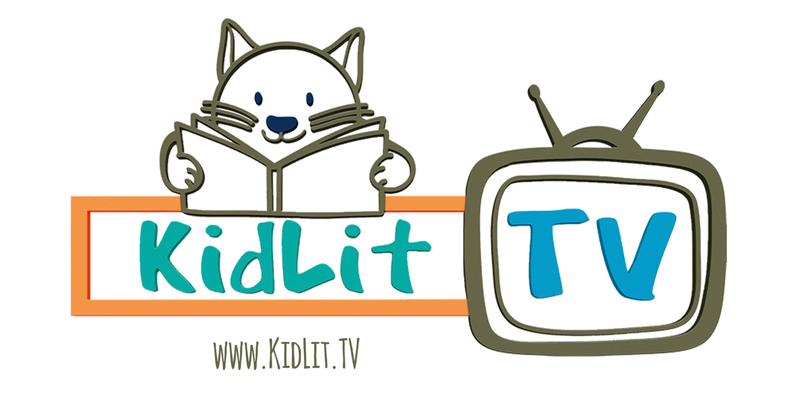 I’m looking forward to Rhyming Picture Book month. 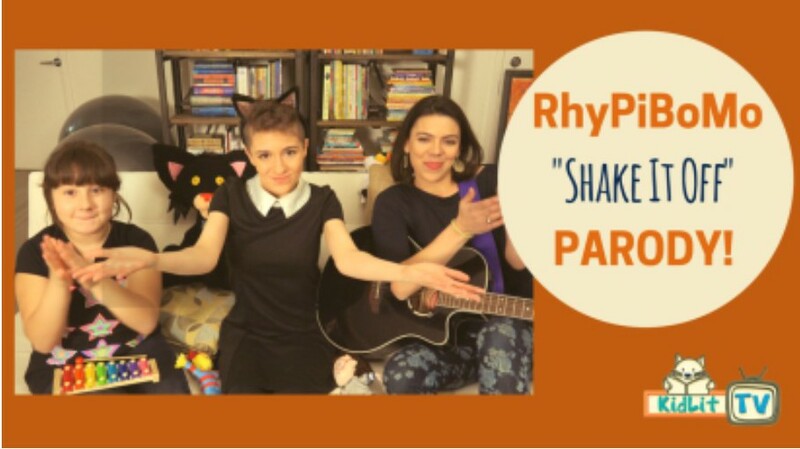 I so need help with rhyme! 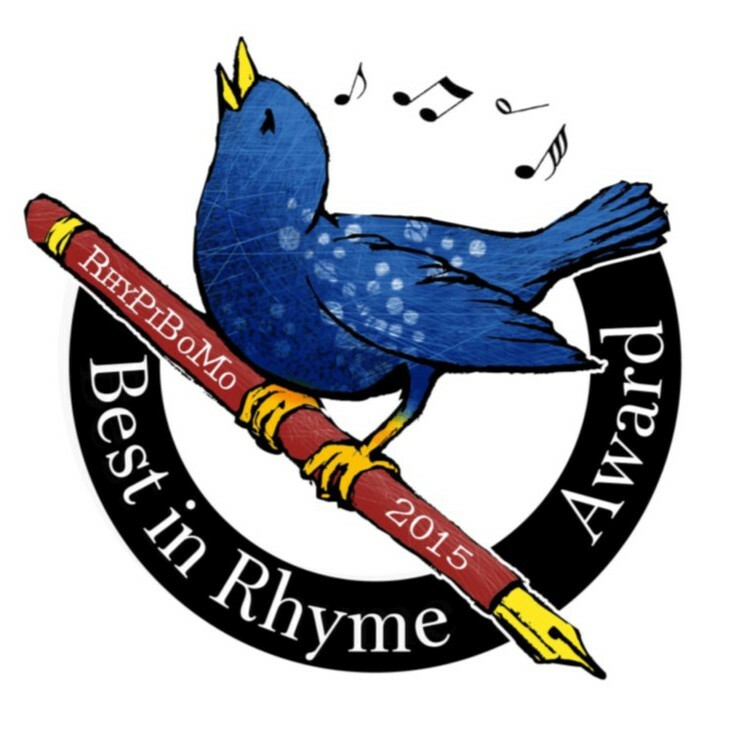 My mind thinks in rhyme, all the time! Do you think I need help? Or should I continue to explore, just a little bit more? Yes it’s offered monthly except in April due to RhyPiBoMo. I’d love to have you.